Now you can share the Perry’s classic you remember as a kid with your kids. 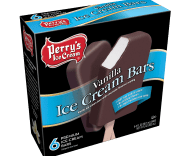 Enjoy creamy vanilla ice cream surrounded by a rich chocolate coating. MILK, CHOCOLATE FLAVORED COATING (COCONUT OIL, SUGAR, COCOA, SOY LECITHIN, NATURAL FLAVOR), CREAM, CORN SYRUP, LIQUID SUGAR, SKIM MILK, BUTTERMILK, MILKFAT, WHEY, NATURAL FLAVOR, MONO- AND DIGLYCERIDES, GUAR GUM, LOCUST BEAN GUM, CARRAGEENAN, DEXTROSE.